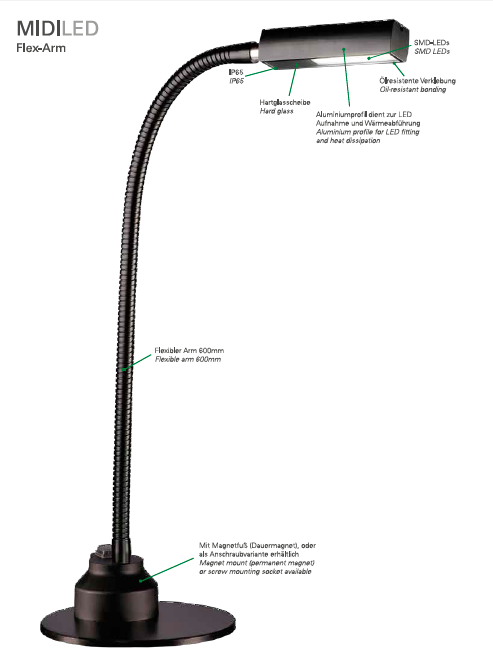 In machinery or at workstations the MIDILED flex arm offers flexible and planar illumination of the work area. The daylight white LED light can be appropriately positioned depending on the situation with the aid of the flex arm. Equipped with high efficient SMD LEDs, the MIDILED flex arm shines a long beam and can also be used for shorter distances. The luminaire is robust, space-saving and offers an economic form of lighting.